Not all young hockey players develop at the same rate. Some are already superstars by the time they’re 19 or 20 while others don’t reach their full potential until they’re in the mid-twenties. 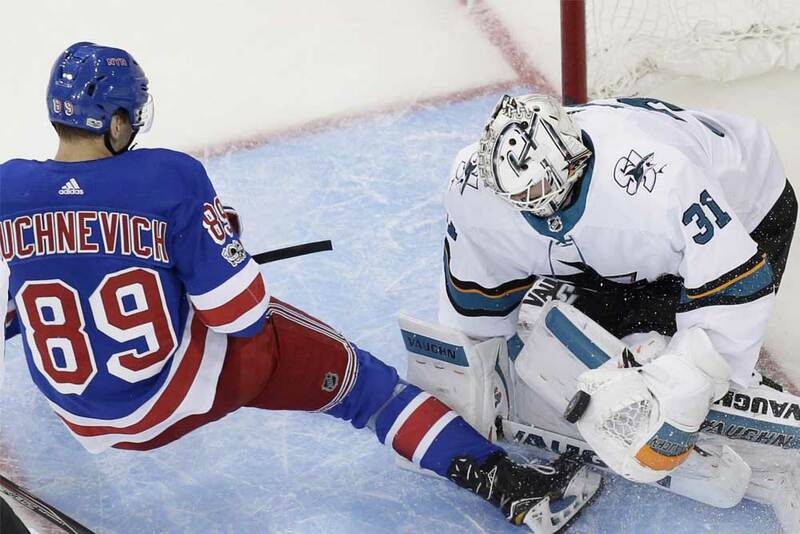 When it comes to 23-year-old Pavel Buchnevich, the New York Rangers are just hoping the young man will hit his peak sooner rather than later. The native of Cherepovets, Russia has been teasing the club and its fans so far with flashes of brilliance followed by extended periods of invisibility. But when is it too early to give up on a solid prospect? We’re talking about a 6-foot-2-inch, 190 lb forward here who was drafted 75th overall by the Rangers back in 2013. As of Jan. 5th he’s yet to play 150 career NHL games, but had already contributed 75 points and is scoring at a pace of .54 points-per-game in the infancy of his big league career. There’s no question Buchnevich runs hot and cold as he recently snapped a seven-game goal drought and notched his first point since December 16th. He’s on pace to finish the campaign with about 20 goals and 33 points, which isn’t bad considering he broke his thumb in mid-November and has missed 16 games this year. Buchnevich played junior hockey in his hometown and also started his pro career there in the KHL. He racked up 23 goals and 69 points in 71 junior outings and notched 37 goals and 87 points in 158 KHL contests. Therefore, he’s never really been known as a big point producer and it could be argued he’s progressing on schedule since leaving Russia. He’s played just four games in the minors since arriving in North America and picked up three goals and two assists in those contests with the Hartford Wolf Pack in 2016/17. The rest of his days have been spent in the Big Apple. Buchnevich registered 20 points in 41 games as a Rangers rookie and followed up last season with 14 goals and 43 points in 74 contests. Perhaps fans and the team got their hopes up a little too high when witnessing the left winger play for his homeland as a youngster. He scored 27 points in 30 games for his nation as a junior and has contributed four points in eight outings with Russia’s senior squad. He also has a gold, silver and bronze medal in his trophy cabinet from various international tournaments as a teenager. With good size, dynamic offensive ability and electrifying moves it’s easy to understand why so much has been expected of Buchnevich. Sure, he could use a bit more muscle and strength on his frame and like most other young players could improve his defensive game. But other than that, it would be a bit far-fetched to suggest he’s been a bust. He got off to a flying start in the NHL in 2016/17 with four goals and four assists after 10 games, but was then hampered by a back injury. His four AHL games came as a conditioning stint before returning to New York and it appeared he hadn’t lost a step. But he managed just a dozen points in his last 31 games as a rookie. Buchnevich was more productive as a sophomore even though former head coach Alain Vigneault bounced him from line to line and once sat him in the press box. His ice time didn’t match his skills and the player was left scratching his head at the end of 2017/18. Vigneault was fired at the end of the season though so if Buchnevich did have any problem with his former coach he was given a clean slate when David Quinn took over as bench boss this season. The early injury didn’t help Buchnevich however and in reality, he’s getting just 13 seconds more ice time on average under Quinn than he was getting with Vigneault last year. He also found himself in the press box as a healthy scratch for a couple of games early this season under Quinn’s watch. Sitting out seemed to have the desired affect on the player as Buchnevich bounced back with three goals and six points in a six-game span shortly after returning to the lineup. However, he then broke his thumb and his momentum went AWOL as he was sidelined for five weeks. Now that he’s back in the fold, Buchnevich needs to prove to Quinn that he deserves to remain there as the club rebuilds with youth. Of course the recent scoring drought didn’t help his cause when it comes to consistency and his ice time has been up and down like a yo-yo. Quinn needs to realize Buchnevich would rather set up teammates than shoot on net. The coach should try to encourage him to unleash his lethal shot a lot more since he’s averaging barely one on target per game. With his entry-level contract running out at the end of the season, the Broadway Blueshirts must decide what to do with Buchnevich. It’s doubtful he’s earned a long-term deal with the club due to his injuries and inconsistency unless he agrees to a bargain price. It’s more likely the team will offer him a shorter bridge deal to see if he can lift his game in the next year or two. If he is signed to a bridge deal and fails to progress, the Rangers could decide to leave him unprotected in the next expansion draft when the new Seattle franchise selects its roster. As a last resort, the Rangers could also trade him before this year’s deadline, depending on what they would get in return. However, if they do give up on Buchnevich at this stage of his career there’s a good chance they’ll live to regret it.